Hillsborough deputies arrested a convicted criminal Tuesday for stealing a woman's car after pretending to panhandle for change. 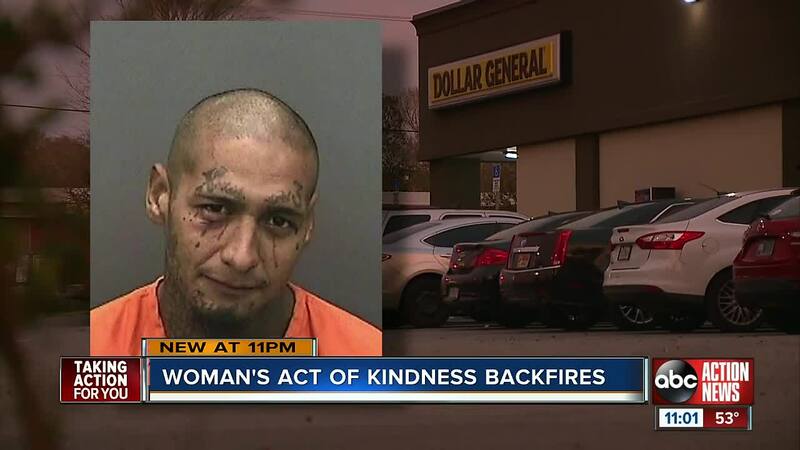 RUSKIN, Fla. — Hillsborough County deputies arrested a convicted criminal Tuesday for stealing a woman's car after pretending to panhandle for change. Investigators say Raul Perez, of Ruskin, was asking for 50 cents outside a Dollar General on College Avenue in Ruskin. According to investigators, when the woman reached into her purse, Perez attacked her and pushed her backwards. They say he grabbed her keys as she stumbled and took off. Perez crashed the victim's Ford Escape in a nearby ditch, then ran inside a duplex and attempted to hide in the attic. When deputies found Perez, he was naked and had just showered. ABC Action News has learned the duplex on College Avenue is Perez's last listed address. A man inside refused to answer the door and our questions. We uncovered Perez has an extensive criminal history, convicted of heroin possession, robbery, and aggravated battery with a deadly weapon. "He’s sorry piece of trash and I hope they give him the book," said Pippin.